Guest reviewer Emma Button from Mellow Mummy likes to relax with a coffee at the weekends so we asked her to test out these snazzy coffee glasses from Ozeri. I'm not a big fan of the y-shape of traditional latte glasses and will normally ask for my coffee in a mug, even when I'm in a coffee shop! 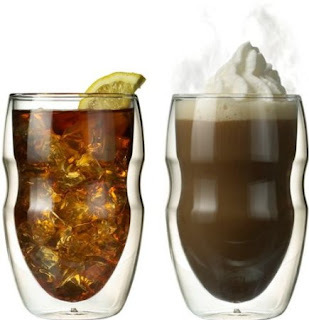 However, I really do like to be able to see what coffee I'm drinking so these glasses are perfect for me - I love the innovative, bumpy shape; it feels comfy in my hand and I can grasp the whole cup as I might do a mug. The really clever thing about these glasses is that the two walls of glass act as an insulator and mean that hot drinks don't lose heat and cold drinks don't lose cool! I was really impressed that I couldn't feel the heat of my coffee through the outside of the glass (another reason why I don't like traditional latter glasses), instead you get a gentle warmth. The fact that these Ozeri Double Wall Insulated Beverage Glasses are freezer safe and dishwasher safe is appealing to me but they feel more delicate than they are described - I'm still not brave enough to put them into the dishwasher and prefer to wash by hand but then I tend to do that with all of my most prized glassware anyway. One of the most impressive things about these glasses is that they look just as groovy holding my Friday night cocktail (I'll have a rum and coke please) as they do with my Sunday morning coffee!